Contributed by Carmine, Cabbagetown South Resident. 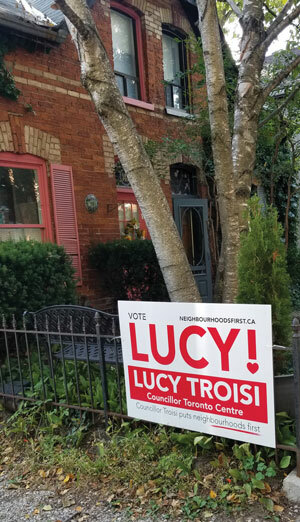 In 10 short months we’ve seen Lucy fight for our neighbourhood safety and well being more so than any other candidate, incumbent, or past councillor. She taken a stand on additional injection sites in our neighbourhood – not because she is against them – but because the current format does not, and is not working. To our experience, there does not seem to have been any thoughtful consideration by previous (incumbent) councillors when it comes to densification of services. Yes, injection sites are needed. Yes, we have an opiod crisis and Yes, we ALL bear a responsibility to help those in need. But are we ALL sharing this responsibility equally and fairly? Our neighbourhood is not like many. We, as homeowners, actually share something in common with the vulnerable…we are all afraid. It has gotten so bad that family members will not visit their loved ones at the William Denison Seniors home in our neighbourhood. The city deserves better, the vulnerable deserve better and our seniors and citizens deserve better. Lucy Troisi has bravely taken a stand where other councillors have not. She has done more in ten months than has been done by others in 8 years. We understand the challenges as does Lucy but she has put our neighbourhood interests above political ambition and it is time that the city as a whole deals with it directly. Go Lucy!